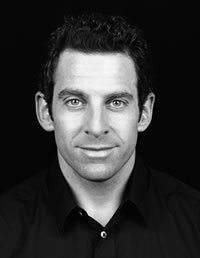 Sam Harris has a master's degree in philosophy and is currently pursuing a Ph.D. in neuroscience. He is a self-proclaimed atheist, author and lecturer. Harris regularly writes columns for Newsweek and the Huffington Post. Harris was spurred to writing following the attacks of September 11, 2001. His motivation was to counter what he sees as the intolerance, bigotry, and ignorance inherent in all religions. This page was last modified on 2 September 2013, at 09:37.